Feb. 23, 12:10pm: The Tigers have announced the deal via a press release. Harrison is officially a member of the Detroit Tigers. 8:33pm: Harrison will be guaranteed $2MM and can earn an additional $1MM worth of incentives, tweets Jon Heyman of the MLB Network. Feb. 20, 2:40pm: The Tigers have struck a one-year deal with infielder Josh Harrison, per Ken Rosenthal of The Athletic (Twitter link). Harrison will step in as the regular at second base for Detroit, per the report, though he’ll need to pass a physical for the deal to be finalized. Harrison, 31, is a versatile defender and quality baserunner whose bat has seen its ups and downs in recent years. Defensive metrics have favorably reviewed his work at both second base and third base, and he also has ample experience in the outfield corners. He hit the open market when the Pirates declined a $10.5MM option at the end of the 2018 season in which he managed just a .250/.293/.363 batting line in 374 plate appearances. While he has had one big season at the plate, back in 2014, Harrison hasn’t come close to replicating it. Since, he has alternated between league-average and lesser seasons, with a cumulative .274/.319/.396 slash line in the four subsequent seasons. That sort of slightly below-average offensive output seems a reasonable expectation moving forward. Statcast hasn’t seen cause to expect better results in Harrison’s batted-ball profile; last year, for instance, he was graded at a meager .275 xwOBA that lagged his .285 wOBA. Harrison will follow former Pittsburgh teammate and double-play partner Jordy Mercer to Detroit. They’ll bring plenty of experience and familiarity with one another to the Tigers’ middle infield mix. That doesn’t leave a ton of room for young players to emerge, but there really aren’t any who seem ready to force their way up at those positions, as the bulk of the high-end talent acquired in the Detroit rebuild to this point has been of the pitching variety. The short-term nature of the contract makes it likely that Harrison will emerge as a trade chip alongside Mercer, Nicholas Castellanos and other appealing short-term Tigers assets this summer as Detroit continues stockpiling youthful pieces with an eye toward a return to contention in the American League Central. 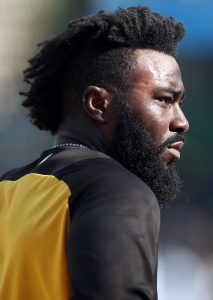 The Angels are among the teams interested in free-agent infielder Josh Harrison, Jon Morosi of MLB.com tweets. They join the Nationals, Yankees, Reds, Astros, Brewers and Giants as teams that have shown interest in Harrison since the Pirates declined his club option after last season. Harrison has picked up vast experience at both second and third base, making him a logical fit for the Angels. They’re currently set to start David Fletcher at the keystone and Zack Cozart at the hot corner in 2019, though there are concerns with both players. Cozart struggled mightily in 2018, the first season of a three-year, $38MM contract, before his campaign ended in late June on account of left shoulder surgery. Fletcher’s defense helped net him an impressive 1.9 fWAR in just 307 plate appearances, on the other hand, but as evidenced by a .275/.316/.363 line with one home run, the 24-year-old wasn’t exactly an imposing offensive presence. Of course, while both Cozart and Fletcher come with question marks, the same is true of Harrison. He held his own at times in Pittsburgh, especially during a 4.8-fWAR campaign in 2014 and a 2.6-fWAR showing in 2017, but endured his share of down seasons as a Pirate. Just last season, the 31-year-old Harrison hit a mere .250/.293/.363 (78 wRC+) in 374 PAs and offered almost no power (eight home runs, .113 ISO). Harrison’s 2018 offensive numbers may have taken a hit as a result of the fractured left hand he suffered in mid-April, and it’s worth noting he has been a roughly league-average hitter throughout his career. Combining Harrison’s normally competent offense with the plus defense he has shown off at both second and third, it’s no surprise plenty of teams are eyeing him on what should be an affordable, short-term deal. Josh Harrison had a year to forget in 2018, leading the Pirates to buy out the veteran infielder after the season and end a relationship that began in 2009. Nevertheless, no fewer than five teams have shown interest in Harrison this offseason, according to Fancred’s Jon Heyman, who lists the Astros and Giants among clubs that have at least considered the 31-year-old. Heyman previously reported interest from the Yankees, Reds and Nationals. Harrison’s coming off an up-and-down tenure in Pittsburgh, where he debuted in 2011 and managed to reach the 2.0 fWAR in two individual seasons. He was at his best during a 4.8-fWAR showing in 2014, which led the Pirates to award him an extension worth a guaranteed $27.3MM early in 2015. Harrison went on to combine for an unspectacular 5.4 fWAR during the rest of his stint with the franchise. He was especially disappointing in 2018, when he totaled 0.3 fWAR and batted .250/.293/.363 (78 wRC+) with minimal power (eight home runs, .113 ISO) across 374 plate appearances. While Harrison only logged a .285 weighted on-base average in 2018, he posted an even less inspiring .275 xwOBA, per Statcast. Of course, it’s worth noting Harrison’s season began in terrible fashion when he suffered a fractured left hand – an injury that sidelined him from mid-April to mid-May and could have played a role in his drop in production. Harrison, to his credit, is just two years removed from a 2017 campaign in which he was among the Pirates’ most valuable players. He also comes with vast experience at second and third base, two positions where he has been a plus defender for the majority of his career. But it could be difficult for Harrison to garner playing time at either position in Houston, which boasts superstars Jose Altuve and Alex Bregman at those spots and also has Aledmys Diaz and Yuli Gurriel on hand as versatile options. Like the Astros, the Giants feature established players at second and third – Joe Panik and Evan Longoria – but those two joined Harrison in struggling last season. The Giants’ new president of baseball operations, Farhan Zaidi, seems to be looking for infield help as a result.